The Food and Agriculture Organization of the United Nations (FAO) recently reported that fish consumption is at an all-time high globally, and “more people than ever are employed in or depend on the [fisheries and aquaculture] sector.” According to the FAO report, “The overall percentage of overexploited, depleted or recovering fish stocks in the world’s oceans has not dropped and is estimated to be slightly higher than in 2006.” This data demonstrates the continued need for innovative fishery management systems that ensure fishermen livelihoods all while ending overfishing and rebuilding fish stocks. 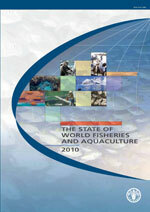 This entry was posted in Uncategorized and tagged Aquaculture, Catch Shares, FAO, Fisheries, Report. Bookmark the permalink. Both comments and trackbacks are currently closed.